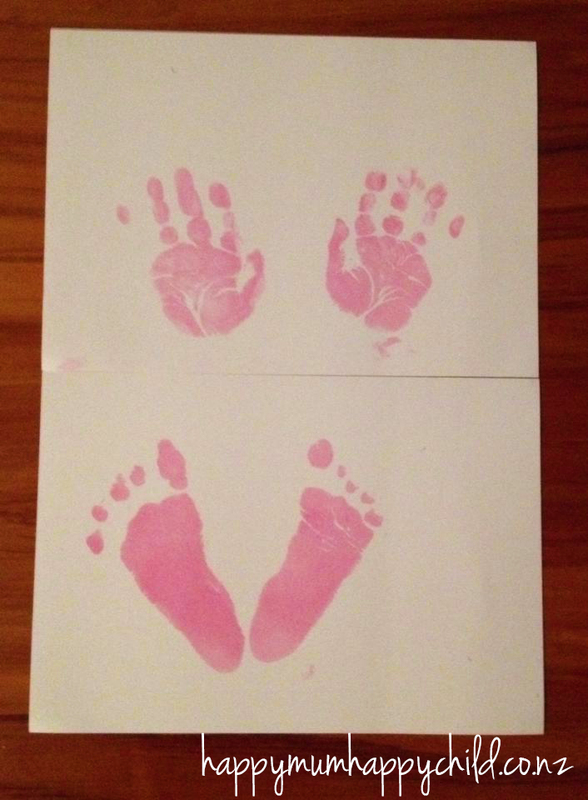 The thought of trying to get your baby’s hand or foot print is pretty daunting, especially when you have to use ink that can potentially go everywhere and make a mess. WELL, I never knew this, but there is a product called “Baby Ink Inkless Printing Kits” – and it’s AMAZING. Basically you just wipe your baby’s feet or hand with the magic cloth, and press onto the paper. IT’S MAGIC. And the kits are non-toxic, and are safely designed for newborns and up. MEGA BONUS. Q2: How easy were the instructions to follow? Q3: Please detail your experience with the Baby Ink Inkless Kit – what did you do? Was it easy to use? I used 2 sheets of paper and did both hands on one and both feet on the other. It is easy to use in the sense that there is no ink or clay to work with. However it is quite difficult working with a wriggly baby, but I think that would be the case with whatever kit is used! Q4: Are there any negative points you would like to discuss – anything you found difficult or just didn’t work for you? I found it a bit tricky to get the print done without touching the paper myself since I had the solution all over my hands also. Q5: Overall, are you satisfied with your experience using the Baby Ink Inkless Kit, dissatisfied with it, or neither satisfied or dissatisfied with it? Q8: How likely is it that you would recommend this product to a friend or colleague? So from Rachelle’s experience she would recommend this product, and I’m glad it went so well for her. I have read other reviews on this product and have only seen positive things. As Rachelle said though, it can be a little difficult not getting your own finger prints on the paper, so it would definitely be easier to use the kit if a friend or your partner holds the baby while you operate the wipes and baby’s hand/foot! One thing I also asked her, was could the kit be used to create a picture. For example, turning hand prints into butterflies (check out Pinterest for that one), and Rachelle said YES. I would imagine you’d want to use an older child though, because it is quite fiddly. Also, just so you are aware, the ink used in the kit is like permanent ink and will last ‘forever’ as such. In saying that, if it isn’t looked after and kept in direct sunlight all day, then I would say it would fade over time like anything in direct sunlight. But it is designed to be a ‘forever’ memory product. You can purchase your Baby Ink Inkless Printing Kit from Squoodles, and they are $29.95 each. They come in 3 colours – grey, blue and pink. Each one is sold separately. Tracy (from Squoodles) has graciously offered Happy Mum Happy Child followers a $5 discount – just enter the code HMHCBI when checking out. This is valid until 31st May 2015. To buy your Baby Ink Inkless Kit, please click here. Be sure to check out Squoodles website, and also their Facebook page – pop on over and say hi!